Are Democracies Failing Their Citizens? New research shows that citizens are losing faith in democracy. For the 12th year in a row, the number of democracies around the world and the overall level of global “freedom” are in decline: democratic countries such as Turkey, Venezuela, Poland and Tunisia have seen political rights and civil liberties reduced. Even in long-standing democracies, such as the US and countries in western Europe, public discontent is growing, voter turnout is dropping, and democratic norms are eroding. In light of these developments, Rasmussen Global and the Alliance of Democracies organized the first annual Democracy Summit in Copenhagen. The purpose of the summit was to bring together political and business leaders from around the world, including former Prime Minister of the U.K. Tony Blair, Former Vice President of the U.S. Joe Biden, and more, to analyse the problems facing democracy and to discuss possible solutions. We were proud to be invited to share data on the current state of democracy in the eyes of people around the world. By design, the future of democracies rests in the hands of their citizens. If the public loses faith in the government or in the benefits of democracy, then they might choose an alternative. So we partnered with Rasmussen global to find out if people around the world, in democracies and non-democracies alike, feel like their governments are failing them. To get nationally representative results for the 50 countries we looked at — which represented roughly 75% of the world’s population — we used a statistical technique called model-based post-stratification (MRP). With MRP we can use the data collected from some respondents to make predictions for how other respondents would answer. This allows us to model the response behavior of niche groups, and thus improve the accuracy of our overall results by making them more representative of each country’s population. For more details, we’ve written about how MRP works and how it helps reduce fieldwork time here. People do not feel like their government listens to them or acts in their interest. The insights we gathered from the survey were sobering to say the least. Overall, respondents from around the world reported huge levels of dissatisfaction with their governments. For one, most people do not believe their governments are providing basic democratic benefits: 51% think their voice “never” or “rarely” matters in politics, 59% say their government never or rarely acts in their interest, 46% rarely or never feel free to share their political opinions, and 56% rarely or never feel that the news they read offers neutral information. Surprisingly, we found that this public discontent is even higher in democratic countries than in non-democratic countries (labeled “free” versus “not free” by the 2018 Freedom House ratings). 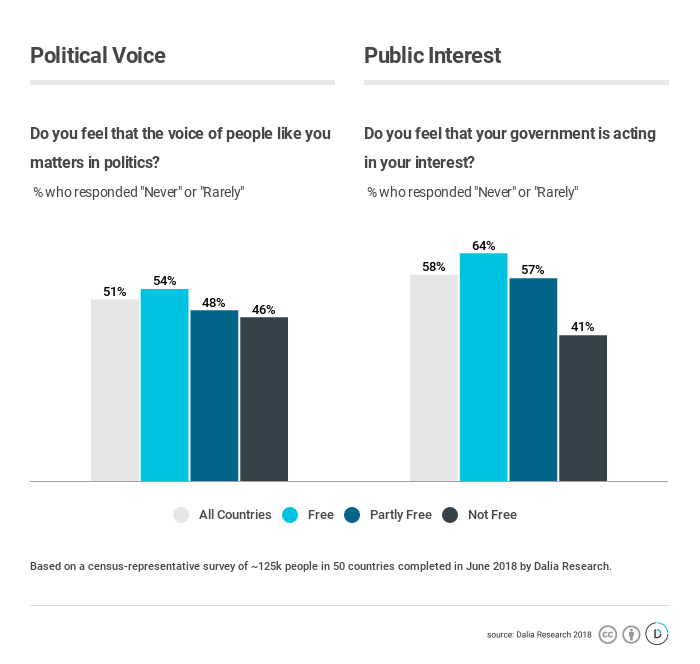 The largest divide was in the public interest dimension, where 64% of the public in “free” countries feel that their government “never” or “rarely” is acting in their interest, compared to 41% in “not free” countries. To see the results across all 4 dimensions and the individual country rankings, check out the full report here. These results show that democracies need to become much better at explaining how citizens benefit from the democratic system. People feel that their voice doesn’t matter, and they feel that their governments aren’t acting in their interest. Even though people around the world show a high level of support for the idea of democracy, they also feel that it is not living up to its name in practice. We sincerely hope that research like this can be used to help political leaders address the rising public discontent and to find ways to increase their governments’ accountability and responsibility for the people they serve. This is only the first attempt, but much more work needs to be done to understand and strengthen democracy! For now, we’re proud to be able to contribute to this debate — if you have ideas for researching this further, please let us know. Also: if you’d like to conduct your own analysis with the full set of results, please send a request to Fred DeVeaux. This article was originally published by Dalia Research on Medium.com on August 13th, 2018. The author organization, Dalia, is a Berlin-based technology startup that distributes millions of surveys in over 90 countries to provide research agencies, academia, public institutions, brands and other organizations access to high-quality market & opinion data.